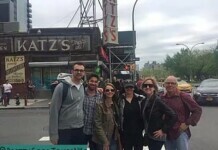 While originally part of the Lower East Side, an immigrant neighborhood, the East Village NY, has separated itself and become home to some of the City’s best restaurants, shops and nightlife. 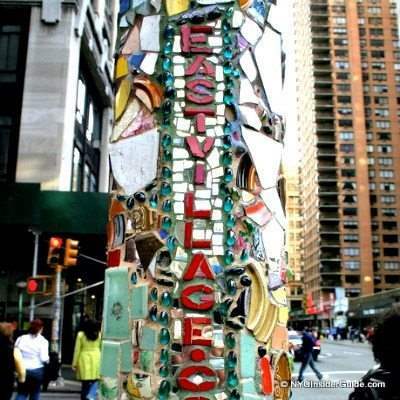 It is full of character, fine dining, shops and live music, and includes a subsection named “Alphabet City.” East Village culture ranges from tattoo parlors and “dive bars” to some of New York City’s nicest hip and trendy hotels. Blue Man Group (Astor Place Theater) or STOMP (Orpheum Theatre, 126 2nd Ave, 7th/ St. Marks Place/ 8th Street) – both interactive off-Broadway shows. Stomp is great for kids, both fun and creative music. St. Mark’s Place (E 8th Street) – souvenirs, tattoo shops, clothing, nightlife, college NYU crowd. Curry Lane – east 6th St. NYC’s Little India, with dozens of Indian Restaurants. S’MAC Sarita’s Macaroni & Cheese (345 East 12th, 1st /2nd Aves) All about Mac and Cheese. Casual, great for kids and students. Veniero’s Pasticceria and Cafe – (342 E 11th St at 1st Ave, )- Italian bakery/cafe famous for pastries and desserts. Momofuku Noodle Bar (171 1st Ave, 10th/11th Sts)- David Chang. Next to Milk Bar, famous Asian dessert place and his “impossible to get into” Momofuku Ko. All celebrity favorites. Jewel Bako (239 E. 5th St, 3rd Ave) – Sushi. Personally not my fave, but major award winner and very highly ranked. Reservations recommended, about $100 pp. Cacio e Pepe (182 2nd Ave (11th/12th Sts) ) – Sicilian food, great outdoor garden, excellent service, romantic. Winebar (65 2nd Ave, 3rd/4th Sts) – huge wine list, great Flatbreads (ever had a Chocolate Pizza? Yum!). Lovely outdoor patio, very cozy indoors! Death and Co (433 E 6th St, 1st/A Aves) – dark, cozy with unique and exotic cocktails, some served for groups in Punch bowls. Eclectic food and small plates. Joe’s Pub (425 Lafayette St., at Astor Pl) – awesome for live music fans, one of the city’s top spots. 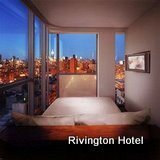 Visitors love this hotel as the rooms are huge by NYC standards, the staff is great and it is surrounded by some of the city’s best dining and nightlife in a historic, yet trendy, area of NYC cannot be beat. The hotel is located along cobble stone streets once occupied by push cart vendors, pickle packers, butchers, and bakers. Now, New York City’s historic past has come to life in the authentic yet modern and comfortable neighborhood hotel.